I use ice cubes (1 to 3 per plant - depending on the plant size - once per week) I use fertilizer every other week (I freeze it in the water in the ice cubes. ) I have silicone ice cube trays that I only use for the plants - that’s important. No-one wants plant fertilizer in their cocktail! I just place the cubes near the base of each plant and let them melt. That’s it. Every once in a while one will hit the floor, but for the most part - it’s perfect. 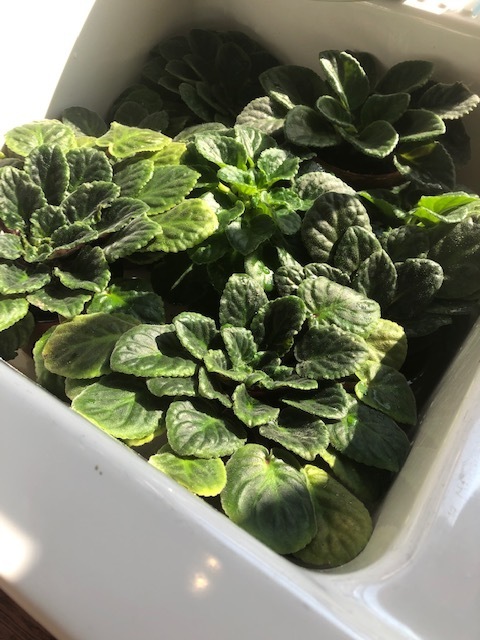 This is ideal for African Violets. I water them weekly. I put about an inch of water in my sink and set the plants in the water. (They must be in a pot with holes in the bottom.) I put fertilizer in the water every other week and that’s it. It’s perfect for violets because they don’t love wet leaves. I let them sit in the water for a couple of hours. Then I pull the plug and let them drain. They are so happy! Give it a try and let me know how it goes!